“The right to contradict oneself and the right to go away” are among the unjustly forgotten human rights, distinguished by Charles Baudelaire. For the first, without it one would never be able to start thinking – in painting or in anything else. And common sense now encourages to use the second without delay. As reported at the end of Words by the Paintings by Jean-Pierre Criqui, in the catalogue of Albert Oehlen’s current exhibition Cows by the Water at Palazzo Grassi in Venice, Baudelaire’s suggestions are a perfect link to the relationship of the visual artist in question with music and different subcultures. “Bringing together elements of jazz and politically ironic elements and bogus contemporary music seemed revolutionary, and it probably is. I got the impulse to bring together incompatibile things from him. 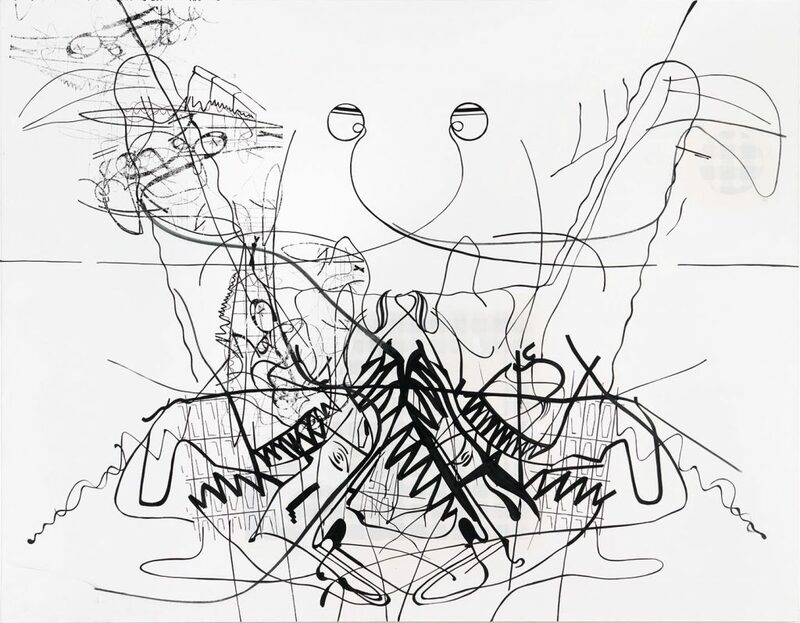 Bizarre and extreme eclecticism corresponded exactly to my idea of a contemporary avant-garde art at that time” stated Oehlen in Mangy: A Conversation and a Playlist, speaking about how Frank Zappa influenced him in his artistic practice in terms of aesthetic: the subject and the rest to the vagaries of universal misunderstanding. As a consequence, the artist developed an insatiable appetite for all kinds of music. References follow, to unrelenting radiophonic pounding and the nightmarish side of this ubiquity (Music Always, 1994), the “disc existence” (Schallplattenexistenz, 2001), rock – also meaning “skirt” in German – (Als Gott den Rock erschuf, muss er geil gewesen sein – Rockmusik III [When God Created Rock Music, He Must Have Been Horny – Rock Music III], 1984) and free jazz – of Ornette Coleman, Albert Ayler, Sun Ra – because the absolute primacy it gives to improvisation (Oehlen’s Conductions, that pay tribute to Lawrence D. “Butch” Morris, an African-American cornetist and composer who borrowed the term from the vocabulary of physics to describe the grammar of gestures he developed in his work structuring the improvisation of various ensembles, which regularly included non-musicians). Currently he is into various formations of improvised contemporary music, as well as pioneers of electro like Plastikman, the proto-grunge American rock band the Melvins, and R&B originals or Indie rock bands such as Dirty Projectors or Deerhoof. 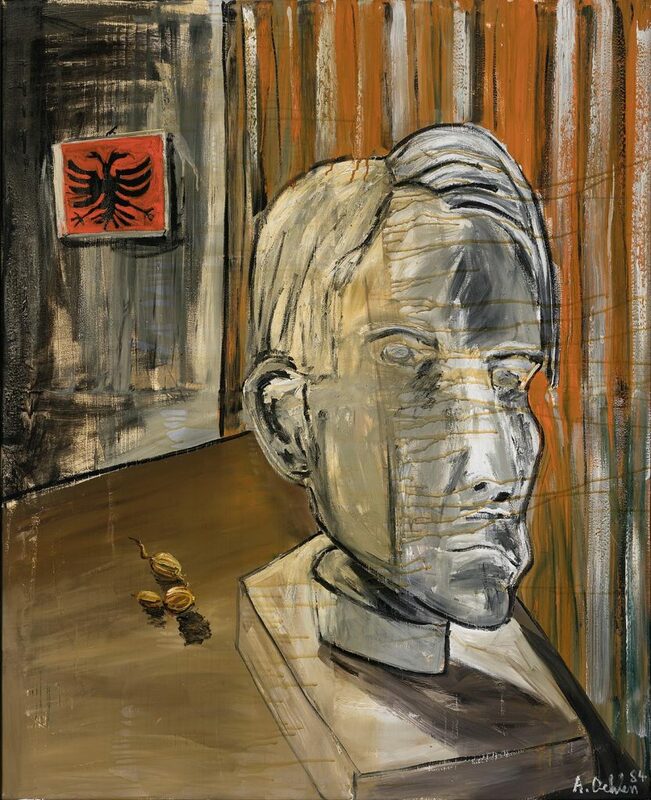 In a recent study of Kippenbergers’s artistic career, Upside down and turning me – Martin Kippenberger ou l’antistase, Michel Gauthier underlined this “role-play” cultivated by the two. “In 1987, on the photographs accompanying the release of a disc by the Golden Kot (“excrement”) Quartet, Kippenberger is on drums, Albert Oehlen on piano, Hubert Kiecol on bass and Günter Förg on saxophone. But the record was made by professional musicians whose names remain untraceable. That’s why it’s so good”. 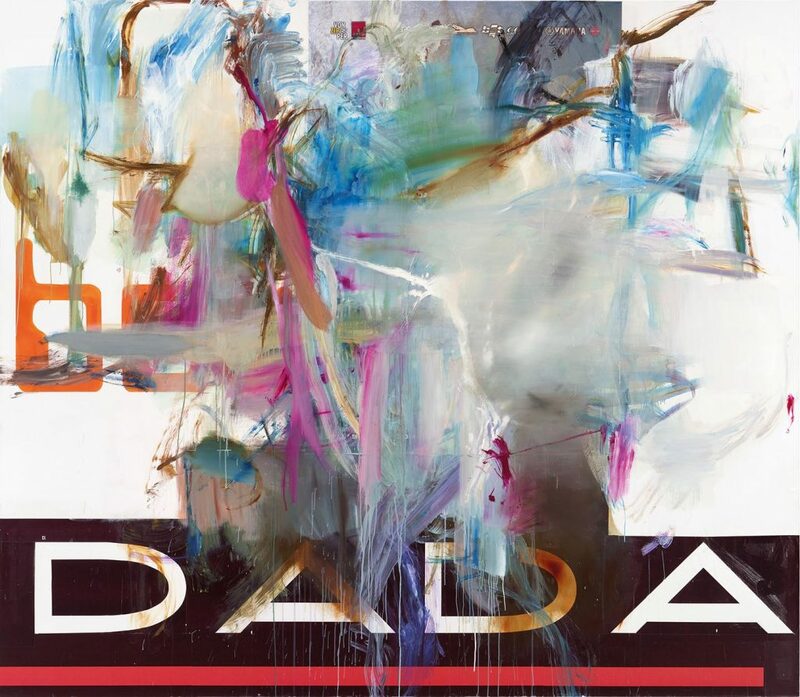 In a trompe-l’oeil game, Albert Oehlen’s name appears on a certain number of recordings and suggests that he contributed as a musician – whereas he admits he does not play any instrument. In 1995 he titled his solo exhibition at the Gesellschaft für Gegenwartskunst in Augsburg Abortion of the Cool, a term with a nod to Miles Davis’ pioneering record Birth of the Cool, it also signals that the heat threatens to be turned on at any moment. The supreme contradiction is in how to master excess, to regulate its effects in the visual order of painting. It is about highly perilous acrobatics, but, as emphasized by Criqui, “in art the culprit is always acquitted“. 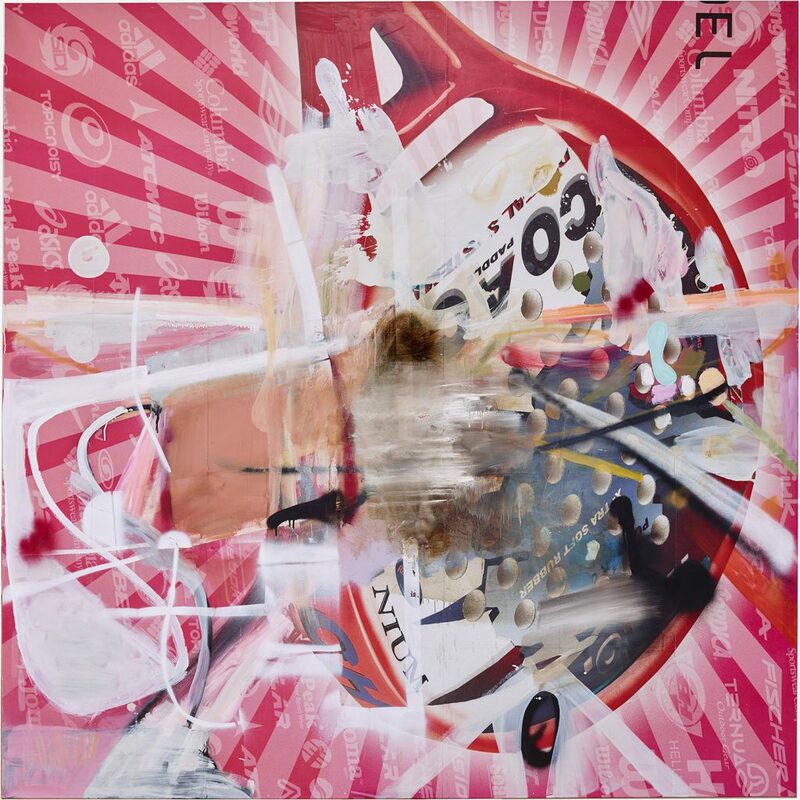 All the painted work by Albert Oehlen reveals the variety of spatial invention, in the optical sense, making the painting never only an object but always a vision. Inspired in his youth also by skateboarding, on the occasion of his show in Venice, Albert Oehlen teamed up with Skateistan – the award-winning international non-profit organization, to empower children and youth through skating and education in Afghanistan, Cambodia and South Africa – by presenting limited editions of art prints on skateboard decks. Ken Vandermark and Paal Nilssen-Love will perform in the same place on November 29. They use jazz improvisation as a way to explore rhythms, timbres, dynamics, densities, shapes and tonalities resulting in an intense experience. You can listen to the playlist edited by the artist on Spotify.